was not given a human, or living being form. Aten also had both male and female traits. He/she was depicted as the rays of light. 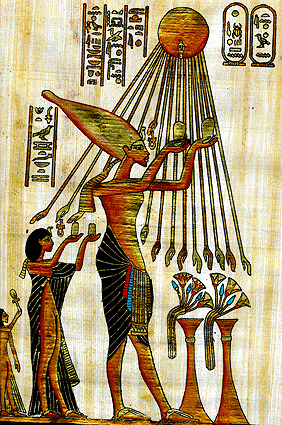 In pictures he was shown as a sun disk, with rays of light coming from it, showering other gods. In many pictures The other gods were holding up offerings for him. He was a giant red disk with long rays of light, complete with open hands. This is one of very few gods that was depicted from a non living being. Sometimes Aten was not featured with open hands, or with hands at all, this was thought to be a time of hardship, and bad weather. Aten was the god of men, and the god of nurturing. He helped the crops grow, and provided the “living light” to all in Egypt. During banquets, and gatherings, Egyptians would bless the god for its giving spirit. They often would sacrifice food and wine, in honor and respect for the god. Aten was shown as a very elegant drawing. Scribers took extreme care detailing the rays of light. Aten was almost a combination of many gods. Ra was the sun god, and Horus the god of the people. Aten was thought to be both Ra and Horus in one embodiment. Aten had both of their main traits. The sun disk that would be putting light off was usually sunk into the wall, and then embossed out, to show some contrast to the rays. These artistic drawings were meticulously carved and preserved by the Egyptians. There were many hymns that expressed the delight and love everyone had for Aten. Akhenaten ascended the throne in Thebes, and declared that there would be a reformation of all religion. After Akhenaten was in rule, everyone was supposed to worship Aten. Akhenaten was not the creator of Aten. Many people knew of him, but Aten was not worship as Akhenaten wanted. During Akhenaten’s reign over Egypt Aten was formally known as the true god of the world. After Akhenaten’s rule Aten was banished from the land. Being part of the sun, Aten didn’t have any brothers, sisters, or parents. He was considered, “the giver to all” while he was worshiped for the short period of Akhenaten’s rule. Aten is sometimes seen as both Ra and Hours, or Ra-Horus. He was a child of Ra, like all the other gods. His true parents were not known, nor do we know if they exist.